One of the best parts of being in a treehouse is the sensation of being high above it all, observing the world from a lofty perch, just like a bird. And when the treehouse you're in actually resembles a giant nest like Roderick Romero's aptly named "Nest" house, we imagine it's nearly impossible not to identify with our fine feathered friends! 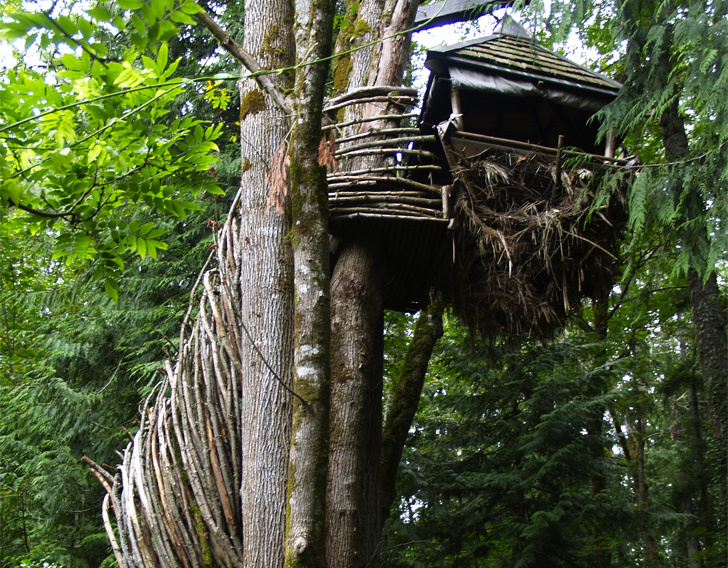 Located in the forests of Yelm, Washington, the wild and wonderful aerie is even made of reclaimed wood, twigs and vines much like a beaked architect would build its own home. One of the coolest features of the Nest is that Romero suspended it from an airplane cable 23 feet off the ground. Unlike more traditional treehouses that are anchored to their base tree, the Nest sways to and fro just like a boat in the wind. We asked Romero what his inspiration for the rustic abode was and (expecting a pretty obvious response) were delighted when he explained that he was actually inspired by “the great pyramids, not to mention that the client lived in a giant copper pyramid!” So the client now owns both a giant copper pyramid and a nest treehouse? So unfair! 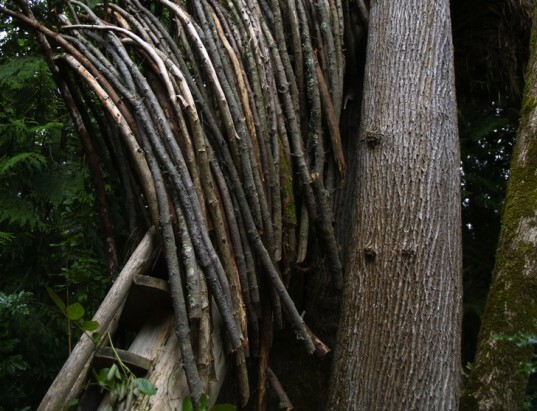 Romero is known for his use of recycled materials and like his other works, the Nest was built out of reclaimed teak, mahogany, cedar and gathered twigs, vines and reeds. The roof is made of copper and cedar. It’s also interesting to note that the Nest was completed in 1997, which speaks to the fact that Romero was utilizing salvaged materials long before it was en vogue. One of the coolest features of the Nest is that Romero suspended it from an airplane cable 23 feet off the ground. Unlike more traditional treehouses that are anchored to their base tree, the Nest sways to and fro just like a boat in the wind. We asked Romero what his inspiration for the rustic abode was and (expecting a pretty obvious response) were delighted when he explained that he was actually inspired by "the great pyramids, not to mention that the client lived in a giant copper pyramid!" So the client now owns both a giant copper pyramid and a nest treehouse? So unfair! Romero is known for his use of recycled materials and like his other works, the Nest was built out of reclaimed teak, mahogany, and cedar. He even used vines and twigs! It's also interesting to note that the Nest was completed in 1997, which speaks to the fact that Romero was utilizing salvaged materials long before it was en vogue.